If you’ve built a bar in your basement, why not fill it with some drinking buddies? (Fast Fish Fact: freshwater fish don’t actually drink water, but saltwater fish do.) 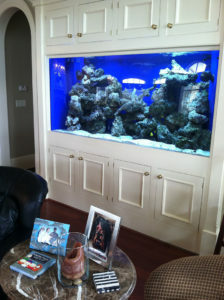 We built this custom aquarium between some beautiful cherry cabinets to separate the bar and the lounge. Because basements aren’t known for their natural light, adding the life and movement that only an aquarium can bring makes an even bigger difference here. Fireplaces and flat screens are out, aquariums are in! When it comes to a focal point in a living room, a well-designed and maintained aquarium can’t be beat. 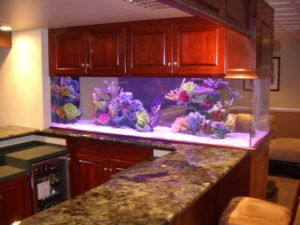 As an aquarium builder, it’s our job to not only design a great aquarium, but to make sure it enhances your home’s existing style. We like how this installation fits perfectly in this built-in while also providing a nice color contrast. Help your customers pass the time by giving them something other than their phones to look at in your waiting room. 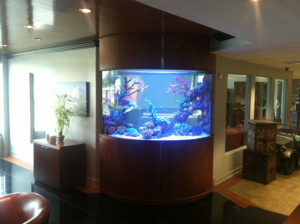 For offices and lobbies, an aquarium isn’t just a beautiful design addition, it’s a smart business choice. 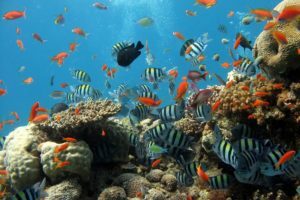 There are a ton of benefits associated with aquariums, including mood boosting and heart rate reduction, both of which are great for a waiting room, especially if you’re running a little behind schedule. If you have a great room in your home, a large custom aquarium is a unique way to break up the living spaces while keeping a cohesive look throughout your living space. 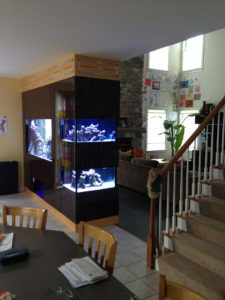 This installation features one large see-through aquarium and two smaller corner wraparound units. This configuration guarantees a gorgeous view from no matter where you are, whether that’s in the kitchen, living room or dining area. If you’d like to get started on your dream aquarium, give us a call at 302-655-1150 or email us and we’ll get back in touch shortly to schedule an appointment.